We woke up this morning to lovely sunshine, had a quick breakfast and then left Port Erroll behind. Our plan was to continue northwards towards Elgin, but with stops to see the little towns and villages on the way. We also needed to replenish our food supplies so we stopped off at Lidl at Peterhead to do some shopping, and managed to collect some nice tasty treats. Oddly, a bottle of their own brand whiskey also ended up in our trolley - can't imagine how it got there! However, after doing a bit of reading we were looking forward to sampling it as it had a lot of excellent recommendations. In Jim Murray's 'Whiskey Bible' it scored 88.5 out of 100, and when it was compared with other whiskies, (both of which we had never heard of), it sounded like an absolute bargain at £13.29! apparently it's nearest rivals were 'Imperial Tribute' at £125.99 and 'Prime Blue' at £99.94!! We did end up having a wee dram last night - and very nice it was too. Anyway, back to the journey. We continued on our way through the little villages of MacDuff, Banff and Portsoy - and it was here that we planned to take a break. However, as John tried to negotiate the little lanes down to the sea front they got narrower and we begun to worry we may get stuck, so that plan was abandoned and we continued on a little further. 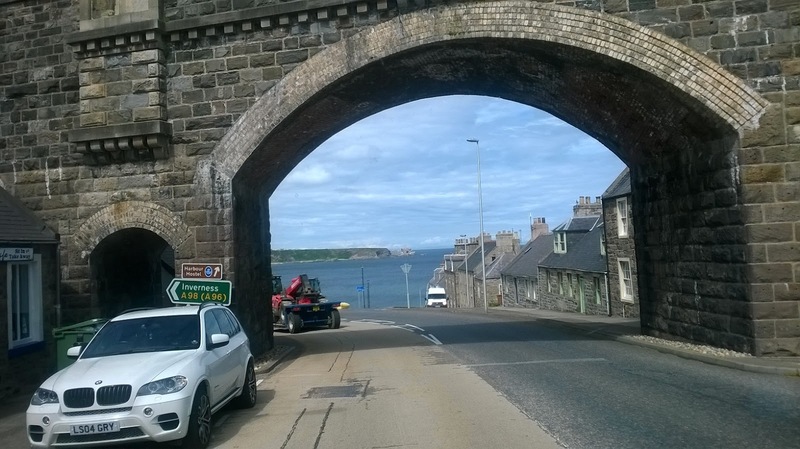 We passed through Cullen where the seascape was framed by this big arched bridge. Bit wonky cos we were driving along! We had a short walk around the very pretty town and then sat outside the 'Tardis' with our coffee and shortbread, and for our entertainment we were able to watch a gentleman trying to 'float his boat'. This required him to reverse down a narrow slipway, a manoeuvre which proved to be very difficult for him, but hilarious for us to watch. He must have had about 20 attempts and only managed it when an all male group joined him and assisted with telling him which way to turn his wheel!! After a while we set off again and passed through Portessie, Buckie, and Portgordon, all little fishing villages with lovely craggy coast lines, and eventually we came to Spey Bay where we came across the Dolphin Centre. We hadn't really planned to stop here, but as there was a very convenient and almost deserted camp site right on the sea front we decided we would. We had lunch and then strolled along to the Dolphin Centre, taking with us our Binoculars in case we were lucky enough to spot any Dolphins - and we were. Apparently the dolphins frequent this area of the Moray Firth because it is here that the River Spey ends it's journey and tumbles into the sea in a fast following estuary, bringing with it a supply of salmon and trout -excellent dolphin food! We'd scrambled up over the large stones of the shingle beach and stood with a good many others gazing out to sea. After a short while I spotted lots of splashing, and when I focused my binoculars on the area I was amazed to see a large number of Dolphins, along with some calves flipping and jumping about in the sea. Apparently, the Moray Dolphins are the largest of the Bottle Nose Dolphins in the world because they need an extra layer of blubber to keep them warm in these cold Scottish waters. Following our excitement with the Dolphins we went for a walk at the side of the fast flowing Spey to see if we could spot any other wildlife - we had read that there are a large number of Ospreys in the area - but alas the only 'wildlife' we spotted were the sculptures below. By the time we had finished our walk the wind was starting to howl and there were some very ominous looking black clouds over the hills, so we headed back to the Tardis to watch the Tour de France. At the moment it's passing through the Pyrenees, and as we have cycled on a couple of those 'hills' we were able to recognise various land marks, and were wishing ourselves back there. As the evening wore on the wind became stronger, and though the night the rain loudly rattled on our windows, but we were snug and warm inside the 'Tardis' so we pretty much ignored it. However, our poor neighbours, who had spent 6 days kyaking down the Spey, had only a small two man tent for shelter, so I'm sure they must have had a restless night. Today has been one of those days were we made a plan and then changed it numerous times. We were going to stay put on our present camp site and cycle along the coast to Lossiemouth. However, following breakfast, the rain was still coming down in torrents and the wind was blowing a gale so we changed our minds. Next we thought we might drive to Lossiemouth and then go for a walk, but that plan went out the window too. Eventually we decided to continue along the coast, were we found The West Beach camp site at Hopeman. Apparently, the site used to be a railway station and all around you can see evidence of this - we are presently parked in the Coal Yard ! The setting is very pretty, but the pitch was quite expensive, and then we discovered that the cheeky buggers wanted another 40p for a 6 minuet shower which starts as soon as you put your money in, and to add insult to injury, the meter was outside the shower door! Eventually the rain stopped but the wind still persisted, so we thought it best to leave the bikes where they were on the back of the van and go for a walk instead. We followed a dedicated cycling/walking track along the sea front to Burghead passing the rock formations of The Stacks and Red Craig and also the many old stakes on the beach that were used to hold salmon nets in times gone by. John thought with a bit of imagination you may think this was a seal!! We also visited the Burghead Visitor Centre where, from the roof, you could see land marks near and far, and it was from here that we spotted a place were we could have wild camped - they always turn up after we've already pitched..
We retraced our steps and pottered the other way through Hopeman but it was really very similar to many of the other little fishing villages we had already visited - I think we are ready for a change of scenery - maybe some big hills and dramatic valleys ! At the moment our plan is to head inland and visit the Culloden Battle Field and then continue down to Aviemore, but who knows if we will change our minds again! To finish off our day we cooked 'fish and chips' with local grown strawberries and cream for afters. As we had travelled northwards we had passed a huge number of strawberry farms where you could smell and almost taste the produce in the air - therefore we just had to sample them! Finally, following our meal, we wondered back down to the harbour to watch the sun set. The wind was starting to blow again and if you look to the left of the picture you can see the storm clouds gathering - I think, (and the weather man agrees) it's going to be another rough night and with more rain forecast for tomorrow we may have to change our plan again. Whatever, we'll get what we're given and will make the most of the day anyway.